Johnny Cantor on commentary with Warren Aspinall. It has certainly been an explosive start to 2017. The games have come thick and fast with the added interest in the FA Cup this month. This weekend should certainly be an interesting occasion as non-league Lincoln plot a way past the Championship leaders. As Albion were moving above Newcastle in the table on Tuesday with the win over Cardiff, their opponents this weekend, also leaders in their division, were suffering a rare defeat in the National League at Barrow. Watching in the commentary box was former Seagulls defender Adam Virgo. It’s certainly credit to Virgs for making that trip from one end of the country to the other! It is with great pride and admiration that I see him excel in his career in the media. He first approached me about trying out things on the mic after injury cut short his career when he was with Crawley in pre-season. Having cut his teeth on BBC local radio and then network radio, he has moved onto television. It is always tough for players when their career on the pitch is over but Adam’s hard work, experience and attention to detail has helped establish him as an excellent pundit on both the Football League and National League, on radio and TV. He is also a columnist who pulls no punches in the papers. As the former Albion centre-back celebrated his birthday this week, striker Glenn Murray was appearing on Sky Sports News and did a great job on live television. The Seagulls’ top scorer is not the only current player who can make an impression in the media in future. Liam Rosenior has an insightful column in The Sun with a view ‘from the inside’. Rosenior and Murray are both eloquent and always interesting to listen to. If they decide to pursue a career in front of the cameras I’m sure they will be a success. Over the years, I have been lucky to work with so many great summarisers covering a variety of clubs. Currently former Seagulls striker Warren Aspinall provides amazing analysis and insight for us on BBC Sussex. No matter how long ago they played the game, the eyes of a former player are key. 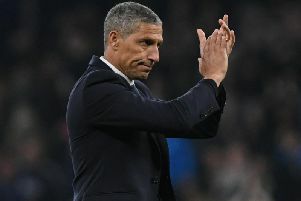 On Friday, Warren spotted a key tactical change from Chris Hughton, who put Steve Sidwell on to push the side forward up the pitch despite having ten men and it was key in the winner against Sheffield Wednesday. Tomer Hemed made the headlines with his winner against Cardiff on Tuesday but once again Warren spotted the vital pass from substitute Oliver Norwood. A month ago I asked what was the most impressive thing about the Albion in 2016 and Warren cited the decision-making of manager Chris Hughton. Credit to them both. It’s great for the Seagulls’ fans to have former and current stars on air and if Albion are successful in their bid for promotion I don’t think Mark Lawrenson will be the only former player who is discussing the club’s progress. The media isn’t for every ex-player. Some are managers, coaches, physios or agents. Some go for a new career away from the game. Either way, it is great to hear their memories and listen to their thoughts. Now I’ve just got to broach with one ex-player the last time Albion met Lincoln. A defeat in the FA Cup in 2003. Mmm... if they have read this they might not pick up!